If you've been around since October you might remember a little thing I did called Crocktober. Now I've been open about the fact that crockpot cooking is relatively new to me, but since October I've started to develop a real love affair with mine. Sure, there have been a lot of fails, but when the successes happen I'm quick to share them with you because I KNOW you love a good crockpot recipe! This Crockpot Italian Stuffed Pepper Recipe is one such success! Before we begin, you will need a few simple ingredients. The first step in creating this crockpot masterpiece is the filling, so in keeping with the Italian theme, I thought...meatballs. And for the first step in the perfect meatball filling, you're going to need to tear up a slice of bread and put in a mixing bowl. I used a hearty, whole wheat, slice, but anything you have on hand is fine. Next add 1/4c Milk to the bread. Then gently massage the milk into the bread, but be sure not to pulverize it. You want to make sure it keeps a little of its integrity. To the bread you will add the tomato paste, garlic powder, Italian seasoning, and dried minced onion. Mix everything together until it is well combined with the bread. After that, you will need to fined dice a zucchini. Why add zucchini you ask? I say why not? I'm always trying to get veggies into my meals anywhere I can! Add the zucchini to the bread mixture. When I am making recipes like this that require cooked rice I like to use this Uncle Ben's Ready rice. Its super easy to work with and it gets the jobs done quickly. 1 cup of the shredded mozzarella cheese and the Parmesan. I added a tsp of salt and a 1/2 tsp of pepper, but you can adjust to your tastes. Now gently work it all together with your hands, kind of like a meatloaf. The next step is to prepare the bell peppers. You will need to slice the tops off of the bell peppers and remove the ribs and seeds. They should look like this when you are finished. Also, if you have a hard time getting the peppers to stand up, you can trim a little off of the bottom to provide a flat surface. Next, fill each pepper with the meatball mixture. And don't skimp! It's delicious! 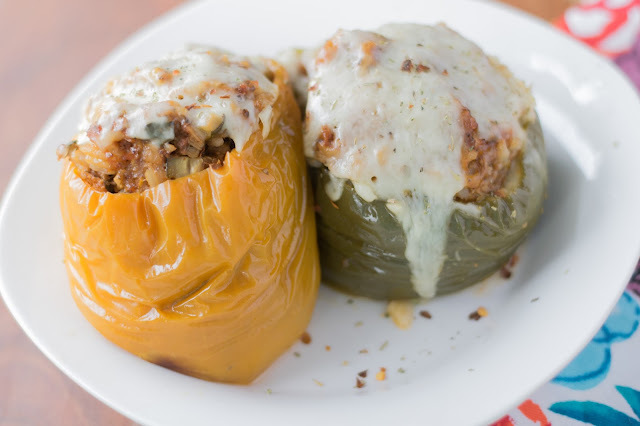 Now place the stuffed Italian peppers into the crockpot. Pour in a 1/4 c of water. Then cover, and cook on LOW for 6 hours or HIGH for 3. I can't even begin to tell you guys how AMAZING your house is going to smell! add the rest of the cheese to the top of the peppers. Cover and cook another 30 minutes. OH-EM-GEE! Look at that ooey, gooey, cheesy goodness! Can you ever really go wrong with cheese though? And there you have it! 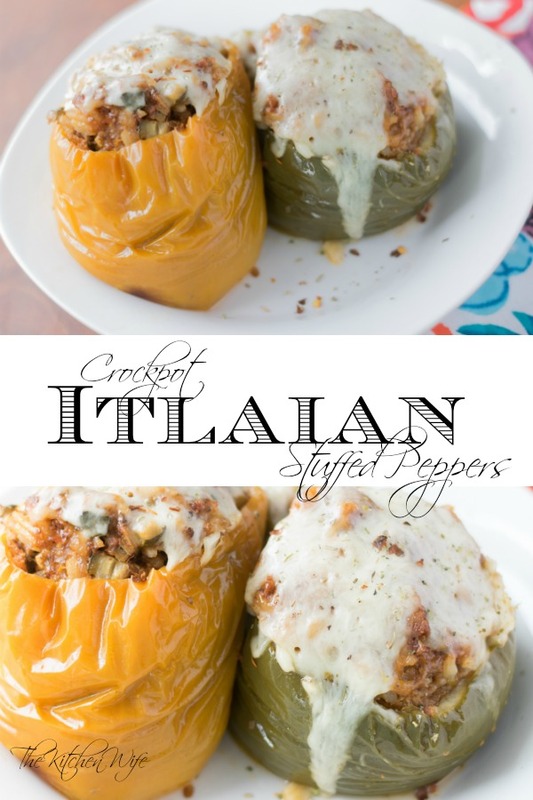 Tender, juicy, and DELICIOUS Crockpot Italian Stuffed Peppers. They really are absolutely mouthwatering, but I feel it's my responsibility to share one tidbit of information. You may notice that the red pepper didn't make it to the plate. That's because, unlike in the oven, the peppers became SUPER tender in the crockpot and the red one kinda fell apart. 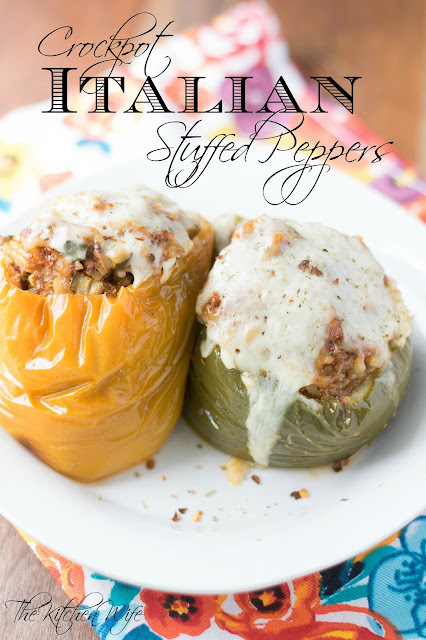 So if you are expecting the same texture as you would get in the oven, you may be disappointed, but if you want a delicious stuffed pepper ready by the time you get home from work...then THIS is the recipe for you so get in the kitchen and give it a try TONIGHT! In a mixing bowl, tear up a slice of bread and add the milk. Gently work the milk into the bread with your hand. To the bread add the tomato paste, Italian seasoning, garlic powder, and dried minced onion. Mix it all together. Now add the Italian sausage, rice, diced zucchini, 1 c mozzarella cheese, and the parmesan. Gently mix everything together with your hands. Next step, prepping the peppers. Cut the top off the peppers and remove the ribs and seeds. Fill each pepper, generously, and place into the crockpot. Add 1/4 c water to the crockpot, cover, and cook on LOW for 6 hours. When there is 30 minutes left in the cooking time, remove the lid and top with the remaining cheese. Cover and cook 30 more minutes.